Shown here is a smaller 8.25 inch plate in the same pattern printed in a slightly deeper blue. It is unmarked. 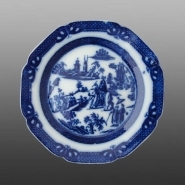 An earthenware indented plate printed in blue with the Elephant and Howdah pattern, sometimes referred to as the Processional Elephant and Howdah pattern. This pattern appears in the surviving W & Co Pattern & Shape Book. Based on the impressed Wedgwood & Co mark found on this plate, it was likely produced during Ralph Wedgwood's tenure at the Hill Pottery. For more on the Wedgwood & Co mark, see Griffin, John. The Yorkshire Potteries, p. 156. For more on the elephant and howdah patterns see the Northern Ceramic Society Journal pages 97-136, Vol. 29, 2013 for an article 'Animals on Printed Pots: Understanding the Roles Animals Played in Early British Wares c.1790-1820' by Loren L. Zeller. To see another interesting variation of the pattern included in the exhibit, click here.